Sorry it’s been so long since the last update. I’ve been extremely busy and little has happened that is particularly noteworthy. Serializing Leash has been the primary reason for updating this blog, but I’m currently abstaining from posting any more panels for the time being, as I’m trying to get something picked up with it. This is the last week of the quarter! Thanks goodness. Although I’ve accomplished a bit here and there, these last ten weeks have been extremely unproductive when compared to the months prior. A lot of this is due to an excess of homework and projects for a class which I enjoy, but whose projects are unusable outside that class. The work is done in a style at odds with the one in which I choose to work, and so I won’t even be using it for portfolio purposes for fear of damaging what little artist identity I’ve been able to establish with editors. Oh, well. Like I said, the quarter is wrapping up, and I’m ready to get back to work fully on Crogan’s Vengeance. For weeks I’ve been stuck on one page – the composition has been all wrong. When I come to a hurdle, it tends to stop me in all capacities, not just the project in question. So everything that required creative thought was basically at a standstill. Last week, though, I figured out my problem and was able to fix the page, and everything has started flowing again. Since the last post, I’ve completed my two page story for the Indie Spinner Rack anthology, which will be premiering at SPX in October. I also finally got together a pitch for Nickelodeon Magazine, which I’ll be sending out this week. Oh! I’ll be teaching three classes this summer. Two of these are two-week workshops on making comics which will be going on in Hopkinsville, Kentucky during the K.I.C.C.S. program, a summer class series aiding in developing skills needed for kids to pursue higher education; the other is an internship in which I’ll be assisting Nolan Woodard with his Intro to Sequential Art class for SCAD. Hunter Clark, Justin Wagner, Liz, and I went Thursday night to see the new Pirates of the Caribbean movie. It was a lot of fun. Sure, there were a few plot points that could’ve been stronger, but I liked it a great deal more than the second film. I approached this one differently, though – it’s not a pirate movie, exactly, it’s a pirate/fantasy movie. Taken as such, it was really enjoyable. The musical score had improved considerably, as well. In doing research for Crogan’s Vengeance, I’ve been reading as much swashbuckling literature as possible, and have come to a remarkable and troubling discovery. 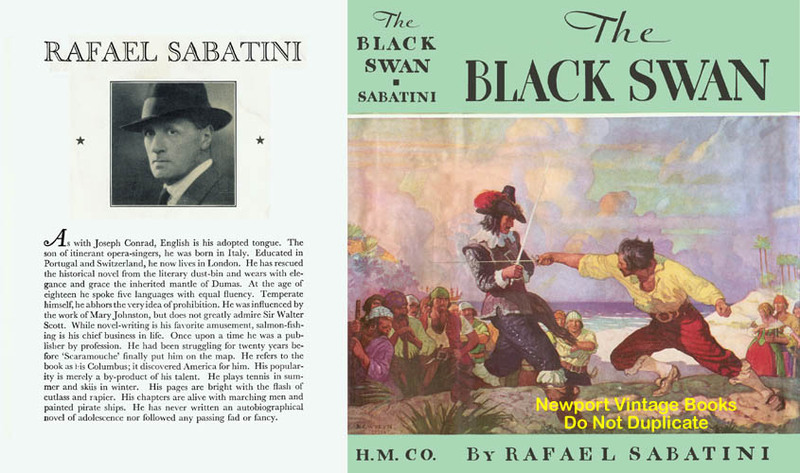 Although I’ve read the few Rafael Sabatini novels available (some from libraries, some from bookstores – most are out of print), and have lamented their fading from the public conciousness (‘cause they’re SO GOOD), I (by a stroke of pure luck) came across the name of Jeffrey Farnol, another 1920s historic adventure novelist whose work is likewise inspiring. And you know what? Not ONE of Farnol’s books are in print in the U.S.! I know that Swashbuckling fell out of favor in the 1950s, and that character-driven fare became the ideal, but that doesn’t mean that the extraordinary work done by these and countless other authors should be left to fade away. It’s terrific writing! Great stories! Granted, one can still find copies on eBay, but these should be in print. It scares me to think that such great work can be so easily forgotten and ignored. It’s far better than what I’m currently capable of; how does that bode for the perenniality of my stuff? Well! What a weekend. It was editor's day at SCAD-Savannah, and so Hunter Clark, Justin Wagner, and I all went up to Savannah on Thursday. We got there a little bit late -- there was a panel discussion (the usual sorts of questions: how do I break into the comic business, etc), and we got there close to the end. After it was over James Lucas Jones came over to chat with me and Hunter for a little while, and I finally met Dove McHargue, a Savannah professor who shares my affinity for pirates, the Brandywine illustrators, Alex Toth, and Disney. Everybody's been telling me to meet him for a while now, and now that I have I can tell you that he couldn't be a nicer guy. He publishes a nautically-themed anthology comic called Cannon, which I'd like to contribute to eventually. Speaking of anthologies, I'm full to the brim. I finally found a comic idea that I'm happy with for the Indie Spinner Rack Anthology, and wrote a rough draft of it. I'll be refining it over the next week or so, and then getting to work with the drawing of it. I've also started plotting my submission to the next SCAD book (the "best" gets a $12,000 scholarship, courtesy of the Cartoonist Society of America), and I haven't even started on my Fluke submission! It's going to be an EXTREMELY busy few weeks. Anyway, back to Thursday. We went to dinner with Shawn Crystal, a colorist named Lee (he does lots of stuff), a writer named Daniel (he does Ghost Rider, I think), and another guy named John - not sure what he does. But they're all really nice guys, and a lot of fun to be around. Lee kept us all in stitches. We met the editors at a really nice bar for drinks afterwards. It's the sort of place you want (or at least I want) in a bar - lots of wood, a back boothed area, a barman with a large moustache and an apron, etc. I spent most of the time talking to James and Daniel, and we turned in around 1:30 or 2. The next day we had breakfast with everybody - James, Shawn, Chris Staros, Chris Duffy, Axel Alonso, probably a couple of others -- that early it's tough to remember. For my portfolio review at school I met with Chris Duffy, who is the comics editor at the incredibly indie-comic friendly Nickelodeon Magazine. He was a really nice guy, and very encouraging. I'll be sending some stuff their way as soon as I get this anthology stuff settled. That afternoon Hunter, Justin and I met up with two of Hunter's friends, Johnny Timmons and Danika, for Pizza at Vinnie Van Go-Gos. After that we went back to the same bar to basically reenact the pervious evening's entertainment, only with a lot more people (this time there were a number of Savannah Professors and grad students). Again, I spent the majority of the night talking with James, as well as quite a few of the Savannah kids. I also met Mike O'Sullivan, who is the editor at Devil's Due and is a SCAD graduate (Justin calls them "SCADuates") himself. He was probably the smiliest guy in the whole place, though he was only there briefly. Chris Duffy never showed up; the next morning he told us he couldn't find his way back to the place. James, Hunter, Justin and I walked back to the hotel around 2:30 or so, after the bar closed up and bumped us out. The next morning we slept in (til 8:00!) and moseyed down to breakfast, where we ate with Duffy who passed on a lot of Nick magazines for us to paw through. Shawn's wife and kids ate with us, too. At the end of breakfast, Shawn and his family took off, Justin left to give Duffy and Will Dennis a ride to the airport. Hunter and I stayed to talk out some stuff with James, and when Justin got back we took off for Atlanta. All in all, it was a great weekend. I didn't have to pay much for drinks (James, a true king of generosity, bought most of them), the weather was nice, the food was good, the company was top-notch... all in all, I couldn't ask for a better, more productive weekend. A sad note, though - Boomer, our family dog who I got as a Christmas present in 1993, passed away on Saturday. He was the sweetest, nicest, most lovable dog around. He smelled like the river, which wasn't great, but he smiled a lot and was as loyal and friendly as can be. He was ALWAYS carrying around and chewing on large (football-sized) rocks and leaving them in the driveway. After walking from the house to the office with my dad, he went behind the building and lay down for the last time. When they went to find him a little later, he had passed away, a giant rock in his mouth. He was buried with it. I'll miss him a LOT, but he was very old and I'm grateful that he didn't ever suffer the maladies that affect so many old dogs. He died as happy as any other day of his life, and our family will be truly smaller without him. Giovanni Potatoe may have found a publisher, which is good news, because I'm out of review copies. Hunter Clark, Justin Wagner, and I drove down to Savannah yesterday for SCAD's editor's day. We spent most of the evening at a really swanky bar, and had a great time. I got to chat with my publisher, meet some new people, see some old ones, and all in all it was a great time.